Africa, I self-administered my second IV successfully in the Serengeti, despite my intense fear of needles. During 2014, I had 44 HAE attacks, most of which were treated with self-administered C1-INH or Icatibant. 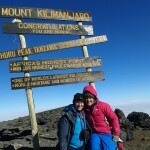 I first discussed the idea of climbing Kilimanjaro with my consultant in January, 2015. I was not sure if I could make it to the top – not everyone who attempts actually makes it – but I wanted to try. To my surprise, my consultant was supportive, and suggested a few preventative measures. 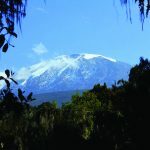 She made me aware of the risks of the climb, most notably that altitude causes increased fluid leakage through the walls of the blood vessels which means that HAE attacks are more likely at higher altitude. As part of my preparation for the trip, I began taking the steroid Stanozolol daily as an additional precaution with the hopes that I would not have any HAE attacks while climbing. I had terrible side-effects from the pills for the first 2 weeks, but I persevered until my body could tolerate them. In the months leading up to the climb, I trained my body for the exertion by walking and eventually running to work. My final endurance test was to run the 6k to work consecutively for 14 days straight. I had my doubts that running the flat lands of London might not be the best preparation for trekking a mountain for 8 days, but was confident that my improved cardiovascular health and endurance would still help. The morning I began the climb, I administered 2,000IU of C1-INH in my hotel room in Moshi, Tanzania. The first few days of the climb felt easy to me. I was even able to completely enjoy the gorgeous and ever-changing scenery. The air was still thick with oxygen. I managed to sleep well. I was on altitude medication that kept draining my body of fluids, so I drank liters upon liters of water every day. I felt strong, capable and excited as the temperatures steadily decreased. There were 10 other trekkers climbing with me, and I was one of the lucky few who got very limited altitude sickness symptoms. But my fears centered around the 6th day of my trek, when I would need to administer another C1 IV at 4,600 meters above sea level. This would be at near freezing temperatures with no running water, after being unable to bathe for 6 days. I had been sleeping with my C1-INH and Icatibant in my sleeping bag at night to ensure it did not freeze as the temperatures dipped below freezing during our assent. I did not sleep on the 5th night of the trek, and it is hard to know if it was from the altitude or because I was so petrified of giving myself an IV on the mountain the following day. In the afternoon of day 6, I sat with one my friends in the dining tent and managed the IV with more ease than I could have imagined. My friend, who happens to be a doctor, was encouraging and supportive the entire time. Having her there made me feel less nervous, and it turned out I was able to give myself the IV without her physically helping. We went to bed early that night, but sleep was hard to come by. For me, the toughest part of the climb had happened in the tent earlier in the afternoon, but I eagerly anticipated the part of the journey that I had not thought would really be possible. At 11:30pm, we awoke to begin our assent to the summit. While I was still in my sleeping bag, I gave myself a subcutaneous Icatibant injection as another preventative measure and carried an additional Icatibant jab and C1 dose just in case I needed it at the summit. We started trekking up the last 1,000+ meters to the Kilimanjaro summit at midnight, under the cover of the most incredible stars I had ever seen. “Poli poli,” slowly slowly, our guides repeated through the night, and encouraged us to keep taking our tiny steps towards the top. I was lucky: I didn’t have any HAE attacks on the trip, and I made it to Uhuru Peak at 5,895 meters (19,341 ft) above sea level with 8 other members of my group. The lack of air pressure at the top of the mountain makes you feel like every breath you take is a shallow, quarter- gulp of air. But I felt giddy with accomplishment after making the heavy footsteps to the top. As I looked out over the vast planes of Tanzania, I reflected on all the times when people had told me that I couldn’t do something because it might make me sick, or that something was not a good idea because I had HAE, or the times when I had to sit on the sidelines because I was too sick to be in the game. Determination, will power and the right type of support made my crazy goals a reality. Dana raised an incredible £2,482.46 for HAE UK.